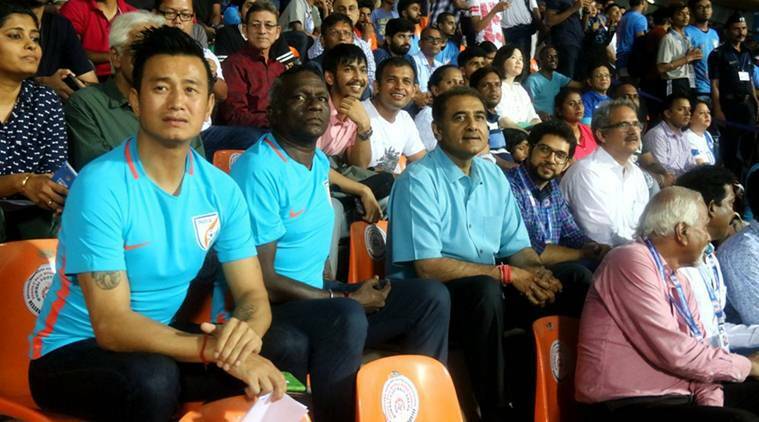 If stalwarts of the game -- such as Bhaichung Bhutia and I M Vijayan -- are to be believed, the scenario is unlikely to change anytime soon with distinct lack of "football culture" in the country. “Sleeping giants”, “passionate giants”, so says FIFA but it’s cheerleaders that best describe India when the world’s biggest single sport spectacle comes around every four years. Playing in a FIFA World Cup remains a pipe dream for India and if stalwarts of the game — such as Bhaichung Bhutia and I M Vijayan — are to be believed, the scenario is unlikely to change anytime soon with distinct lack of “football culture” in the country. On and off, here and there, football is discussed in the build-up to the quadrennial FIFA event, but hopes of competing continue to border on absurdity. “I think that will remain so till we have a strong sporting culture, a strong football culture,” Bhutia, who wore the blue jersey a record 104 times during an illustrious career spanning a decade and a half, told PTI. Events, such as a friendly international involving Lionel Messi’s Argentina and a star-studded Bayern Munich turning up for Bhutia’s farewell game, did generate unprecedented frenzy all over the country but these at best can be termed as exceptions. But the 41-year-old Bhutia feels more “needs to be done” for the global sport in a country otherwise enamoured with cricket. FIFA remains convinced of football’s potential in the world’s second most populous nation, its belief bookended by the successful hosting of the U-17 World Cup last year. After a string of impressive results over the last couple of years, India are currently ranked 97th in the FIFA chart, but rankings alone are not a true reflection of progress. “It’s obviously great that we have done well in recent times, but if you talk of World Cup, then it’s a different thing,” Bhutia said, reiterating, “building a football culture is paramount”. “There is no dearth of talent, the infrastructure is much better now, and youth development schemes are being initiated. But culture is one thing that is still missing,” the ‘Sikkimese Sniper’ harped. The 41-year-old Bhutia himself is one of India’s best strikers to have played the game. Vijayan, the man who preceded Bhutia as the torchbearer of Indian football, was often described as one born in a wrong country owing to his precocious talent. He also feels there is lack of football culture in major pockets of India. “That is there, I agree. I think our clubs and associations must look forward to tying up with top clubs from overseas, and when I say tie-up it’s not just for the heck of it, I mean serious tie-ups. “For example, the Barcelona academy will do a world of good to our budding footballers,” the 49-year-old Vijayan said. India is full of football talent, Vijayan is convinced, and he recalled a meeting with a foreign scout to buttress his point. “We were discussing that when we put the Indian age-group kids among the ones from other football countries, you will not be able to differentiate the Indians and the ones from elsewhere. “As the players grow, it is important that the transition into the senior team happens in the best possible way,” Vijayan said. Stressing on youth development, Vijayan said it’s imperative to “catch them young”.